VOICI LE MEGA RARE PREMIER E. DELVIS PUBLIÉ EN FRANCE EN 1956, ET CONNU PAR LE GRAPHISME DE SA POCHETTE SOUS LAPPELLATION DE LA BATTERIE RCA-FRANCE NAVAIT PAS ENCORE PERÇU LIMMENSE POPULARITÉ DU JEUNE PRODIGE LORSQUELLE DÉCIDA DE SORTIR CE DISQUE DOU LA POCHETTE TRÈS GÉNÉRALISTE..
CELLE-CI EST EN TRÈS BON ÉTAT, TOUT JUSTE COMPORTE-T-ELLE QUELQUES MANQUES AU NIVEAU DE L'OUVERTURE AU DOS... LES BORDS SONT EN EXCELLENT ÉTAT, PAS DÉCRITURES NI ÉTIQUETTES. Paris AU BAS DU VERSO. LE DISQUE AVEC TOUT SON LUSTRE ET SA SOUS-POCHETTE CRISTAL DORIGINE EST EN SUPERBE CONDITION, PASSE IMPECCABLEMENT AVEC QUELQUES MINIMES GRÉSILLEMENTS ET LES LABELS SONT SANS DÉFAUT.. THE RAREST ELVIS FRENCH RECORD EVER, HIS FIRST EXTENDED PLAY PUBLISHED IN FRANCE IN 1956... RCA-FRANCE HADNT CAPTURED YET THE INCREDIBLE COMMERCIAL APPEAL OF HIS NEWEST YOUNG SINGING STAR AND THIS RECORD WAS ISSUED WITHOUT A PICTURE, JUST THE FRONT COVER DISPLAYING A DRUM KIT DRAWNING ARTWORK (THATS WHY THIS ONE IS KNOWN IN THE COLLECTORS FIELD AS THE DRUM KIT INSTEAD OF ROCK AND ROLL N°2) : THE COVER OF THIS HOLY GRAIL RECORD IS IN NICE SHAPE WITH SOME FRAYING TO THE OPENING SIDE ON THE BACK, NO WRITING OR STICKERS... THE RECORD IS IN CRISP CONDITION, RETAINS FULL LUSTER AND PLAYS GREAT WITH MINIMAL, OCCASIONAL SURFACE NOISE... LABELS ARE CLEAN AND THIS GEM COMES WITH ITS ORIGINAL ONION SKIN PAPER SLEEVE. 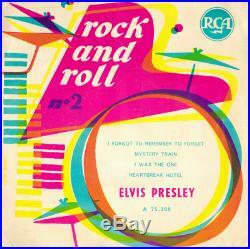 The item "ELVIS PRESLEY ROCK AND ROLL N°2 (LA BATTERIE) ORIGINAL 1956 FRANCE EP 75.309" is in sale since Tuesday, April 9, 2019. This item is in the category "Musique, CD, vinyles\Vinyles".unlimited" and is located in PARIS. This item can be shipped worldwide.